Are you planning ahead in November so that you can relax and focus on the things that really matter in December? Don’t worry. I’m not pulling out my decorations yet. This month is all about gratitude, but you will be seeing a lot of Christmas prep on my blog. That’s because I want to make sure that my Christmas ideas make it to you in time! Today I’m sharing a fun Christmas craft for kids — these adorable yarn Christmas trees that double as holiday decor! My “helper” just couldn’t resist sneaking her hands into the pictures. It was driving me crazy, but this one actually turned out to be my very favorite picture. When I started making my Knotted Yarn Christmas Tree decor last year, the kids wanted to get in on the action. It wasn’t too difficult to adapt the project into something a little more kid-friendly. I originally shared the project on Juggling Act Mama, and now I’m sharing it here. With a little yarn and glue, we created these fun trees in no time. 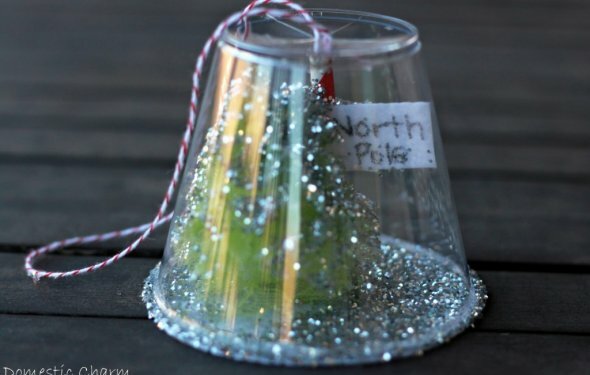 Since the decorations are attached with pins, the kids can redecorate the trees as often as they want. Let’s get started on the tutorial! Begin at the bottom of the cone by drawing a bead of glue across the bottom edge of the cone. Press yarn into the glue, and continue wrapping it completely around the bottom of the cone. Continue to add more glue as you go, making a continuous “snake” of yarn around the entire cone. If you are working with young children, you will need to help them with the first few loops around the cone until they get the hang of it. Decorate the trees by attaching buttons and beads with decorative straight pins. My girls were pretty tame with their decorations. The possibilities are endless. Add stars to the top. We created ours with card stock and glitter glue and attached them with toothpicks. If your tree needs a pedestal, use the yarn wrapping technique to cover just about anything! Ours is created with a plastic sauce container. You could use a dixie cup, an empty yogurt container or whatever you have laying around your house. Now the fun part – – display the trees all over the house or in your children’s rooms. They’ll be so proud to see Christmas decorations that they created themselves. News reader air force force news. Getting Started is a 1979 animated short by Richard Condie and produced in Winnipeg by the National Film Board of Canada. The film is comical look at procrastination, based partly on the filmmaker's own experiences, portraying the inability of a pianist to rehearse a Debussy composition.